Thanks to all our recent rain, big and beautiful are the only words to describe the blooms on Shasta Daisies this year. Shasta Daisies (latin name: Leucanthemum superbum) are a classic mid-summer flower that will give you many blooms to enjoy throughout June, July and even into August when you deadhead spent blooms. Shasta Daisies grow best in rich, well-drained soil in full sun. We especially like varieties ‘Becky’ and ‘Daisy May’. ‘Becky’ can grow up to 3-4 feet tall by 2-3 feet wide with large 3” flowers with a perfect yellow center and white petals. 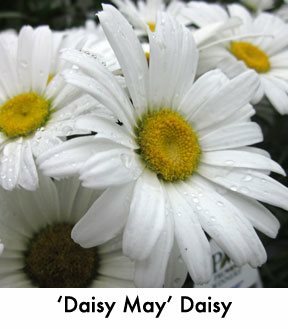 ‘Daisy May’ grows 18-24 inches tall by 18-24 inches wide is a more compact plant that sends up a multitude of white daisy blooms in June. A fun, newer cultivar, ‘Banana Cream’ puts a twist on the traditional with flowers that open light yellow and brightens to white as they mature. 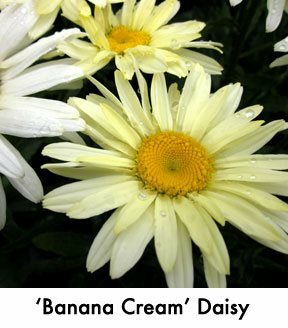 ‘Banana Cream’, just like ‘Becky’ and ‘Daisy May’, are easy to grow and if deadheaded will re-bloom. Best of all, Shasta Daisies make a great cut flower that last for weeks. If you love the look of daisies, there is a profusion of flowers that share their sunny look. Coreopsis bursting in so many beautiful colors. Japanese Aster with its blue blooms. Asters with fantastic fall color. Coneflowers, Black-eyed Susans and even Blanket Flowers (latin name: Gaillardia) with long-lasting summer color. Coreopsis ‘Mercury Rising’ with its two-inch, velvety red flowers and frilly golden yellow centers is just a blaze of color. The golden yellow flowers of ‘Zagreb’ and pale yellow flowers of the ‘Moonbeam’ are floating in mass over their airy fern-like foliage. And the light yellow and dark red petals with the golden button center of ‘Cosmic Eye' boldly contrast from its bushy mass of bright green foliage. Coreopsis grow best in full sun, and light dry soils. They will bloom almost all summer and you can remove the faded flowers to encourage more blooms. We like to use the varieties with fern-like foliages as a filler in a cut bouquet. Japanese Asters (latin name: Kalimeris incisa) are carefree plants that are covered with daisy-like blue flowers from mid-summer to early frost. These disease resistant plants grow about 12-18 inches tall by 12-18” wide and are drought tolerant. With so many options out there, you can easily add the bright, cheerful look of daisies to your garden. Stop in and explore the many different types available and best of all—our Summer Garden Sale continues this week!